Officially endorsed and celebrated by The Michael Jackson Estate, this "Ultra Limited Edition" of Infinite Statue’s Michael Jackson’s Thriller Bust is a spectacular tribute truly worthy of a King! Strictly limited to only 82 pieces made (to denote the 1982 release of Michael’s Thriller album), this statue quickly sold out shortly after its 2010 release, and has been highly sought after by collectors ever since. Each piece is hand numbered (up to 82) on both the box and on the base of the statue itself, and has been meticulously designed and crafted by renowned artist Mauro Gandini. Made from the finest Polystone with gold metal plating, the statue stands more than 7 inches (18cm) tall…and weighs over 1 kilogram! Fully and officially licensed by MJ Licensing, LLC, this HIStoric sculpture is made by Infinite Statue of Italy, long known for creating highly collectible works of art with unparalleled workmanship and attention to detail. Easily the most impressive and unique officially licensed collectible of the past two years, this statue is visually stunning, and truly needs to be seen up close in person to be fully appreciated! 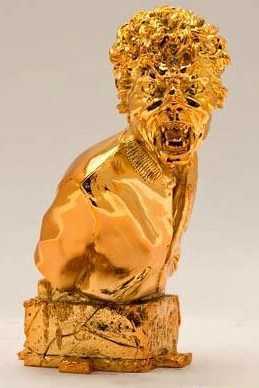 John Landis, director of Michael’s legendary 1983 Thriller video, bought two of these gold statues to display in his home office in November, 2010. Landis was so impressed with the amazing quality and workmanship, he wrote the President of Infinite Statues a personal thank you letter! Infinite Statue is proud to present the “Michael Jackson Project”, an initiative that will project fans and admirers of this great artist into a new dimension through a real and impassioned tribute to the “King of Pop”! No other in the world of music, dance, entertainment and public image was, and perhaps will ever be, like Michael Jackson, who had become the biggest star of all time. His persona became a legend, leaving an indelible mark on the world of imagination for over thirty years. Always revolutionizing music, dance, videos, clothing, style, image, promotion and live performances as well as shattering all sales records, something which was not matched by any other artist. He was an epochal and worldwide phenomenon knocking down racial, geographic and cultural barriers much like a global earthquake. 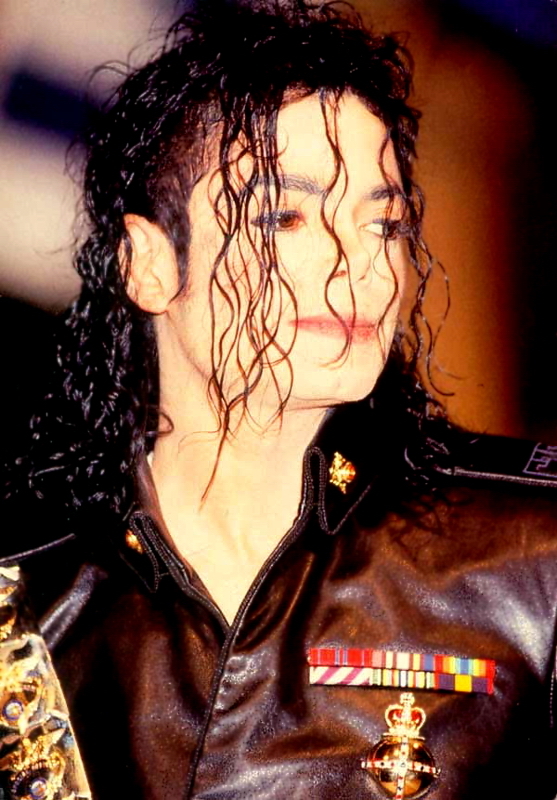 Michael Jackson is without a doubt one of the most important icons of the century. Our adventure begins at the "King of Pop's" artistic peak of "Thriller", the most famous album of all times, which forever changed music with over 110 million copies sold. Some of the most innovative and famous videos of all time came from this album, starting from the title track itself, "Thriller". Directed in 1983 by director John Landis, the video "Thriller" was considered the most important musical video of all times, so much so, as to be conserved by the National Film Registry in the United States Congress Library. It was the most expensive video ever made and also the most successful, just think of the VHS "Michael Jackson: The making of Thriller", which sold over 9 million copies! Only 82 pieces have been made of this Special Ultra Limited Edition bust in celebration of the year in which the album “Thriller” was released and to make this authentic collectors piece one of a kind in its category. Every last detail has been carefully studied directly from original images and videos, backstage footage and photos of Michael Jackson. All of the minute details have been faithfully reproduced with the utmost care and highest artistic level of sculptures that make this series an authentic collectors cult dedicated to fans of Michael Jackson or people who want a piece of pop music history. Taken from the original sculpture of the Limited Edition version, this version has been treated with a special fine gold metallic chromium plating directly on the Polystone base so that the final result is an extremely precious and resplendent collectible. A tribute to the great prestige for the biggest star of all times and only 82 fans will be able to own this piece and place it together with their most coveted and rare collector’s items. A statue that is already a Legend. *The bust in this listing is #45 (see below for details and here for more pictures of the exact item). For sale in this exclusive listing is the statue numbered #45/82. The statue comes pristinely still sealed in its original deluxe collector’s box. 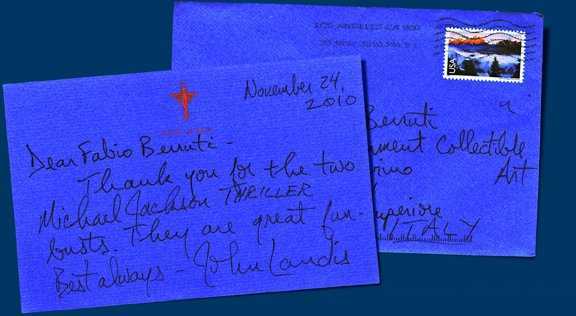 The box itself is a collector’s item, hand numbered on the bottom #45/82 (see above), with special gold foiled luminescent “Thriller” writing on each front side. The statue has been safely stored away in a private collection since it was purchased directly from the manufacturer. You can see several pictures of the exact box in this listing right here. Please note that the pictures of the opened bust were taken from a different statue (#47) to show you what the statue looks like inside, and the hand numbering on the bottom. 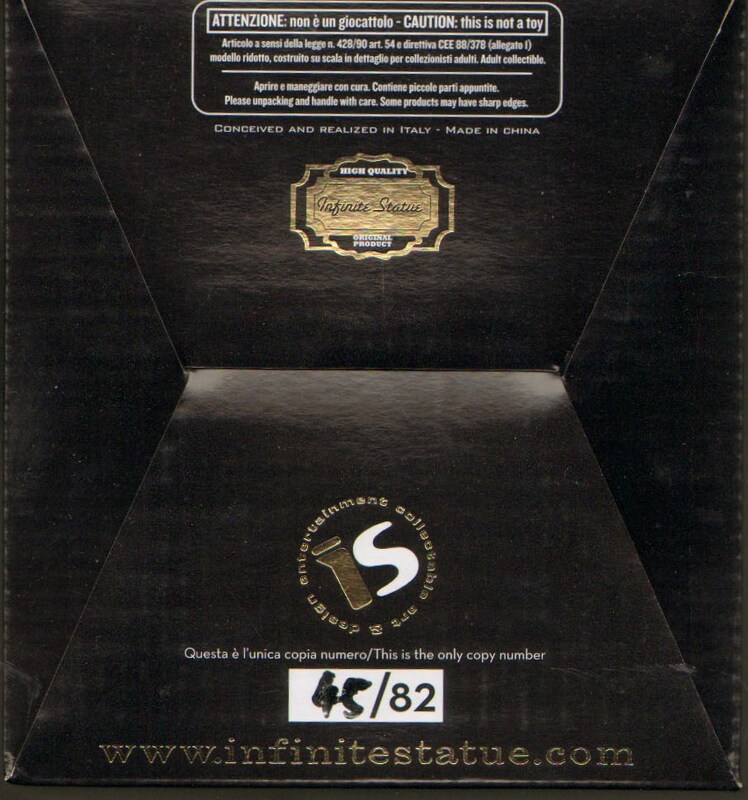 The statue #45 in this listing is never opened and still sealed in the original box…you will be the first one to open it! Because of the incomparable quality and extremely limited quantity of this statue, its value is sure to continue to increase rapidly in the coming years. Already sold out since 2010, these incredible statues have been selling recently on Yahoo Japan for $2,000! This is your once in a lifetime chance to own this HIStoric collectible…for only $799. The statue will be sent by EMS Airmail and fully insured to ensure that it arrives to you safely. And we’re so sure you will be THRILLED with your “Ultra Limited Edition” statue, we are offering a 100% money back guarantee if you are not completely satisfied. Simply return the statue to us within 7 days of receipt. We will issue a refund (less shipping fees) when we receive the statue—provided it arrives in the same condition as it was sent in. If you have questions or would like further details, please email us. Also available in a colored limited edition version.